Happy Poker New Year from Las Vegas! I’m down here in a city with its own bagpiper blowing to announce the coming of…whatever. 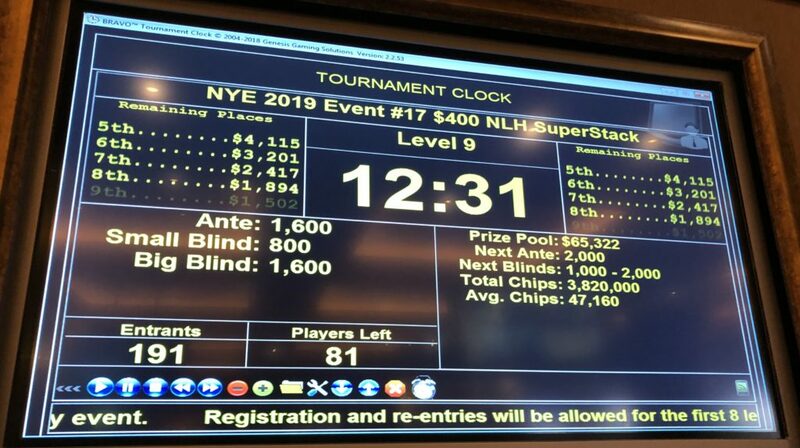 I missed all of the New Year’s Eve shenanigans here (though I was at a party in Beaverton with an upside-down Christmas tree), catching an emptyish 8am flight on the 1st so I could take a shot at a $100K guarantee event at the Venetian. 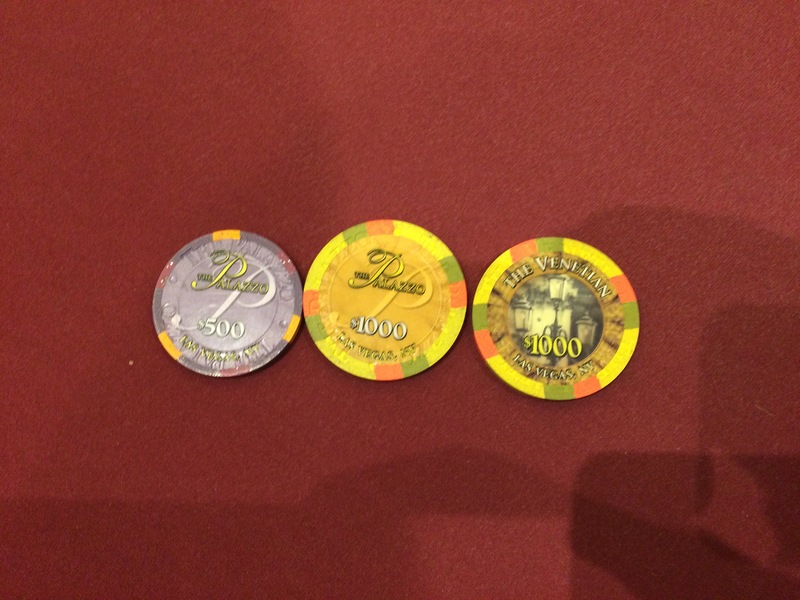 The first couple of levels were fantastic, and I almost tripled my stack. 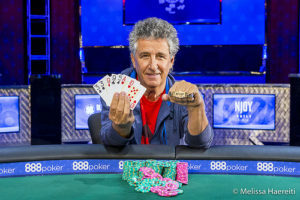 It was slower going after that, though I was still in good shape, knocking out three players from a table that included WSOP bracelet-holders Allyn Shulman and her husband Barry Shulman, who own CardPlayer Magazine, A little brush with poker media dynasty, that. Allyn started at the table, Barry showed up several levels in as tables were consolidating, then Allyn busted and I ran QxQx into Barry’s KxKx and was severely crippled before I went out two hands later after I limped AxJx got called by 2x2x in the big blind, and jammed into him on a KxJx2x flop. That was it for me in the $100K. If you look closely, you’ll see Kao Saechao in the standings with a decent stack. Day 2 starts with 74 and pays 54. 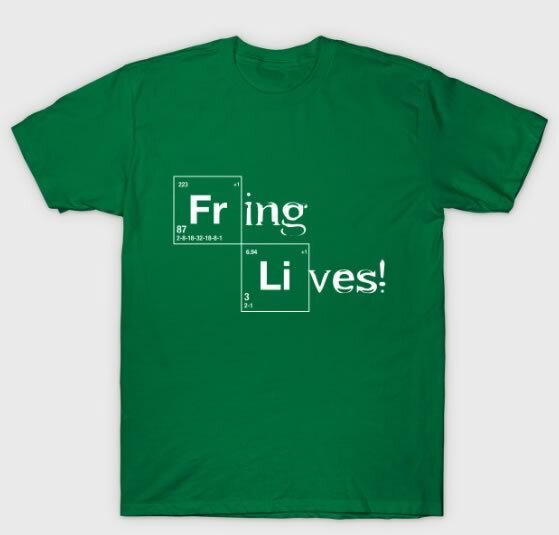 It’ll all be over by the time you read this. Played a little PLO, went back to the room and got into a WSOP.com $20K where I did well for a while but was hobbled by the fact I hadn’t realized it was a rebuy and addon (it pays to look at the structure before you buy in at the last minute!) then was playing catchup and was crippled (again) when I called a 15bb late-position all-in from the big blind with A♥Q♠ and Q♦T♣ hit a ten right on the flop. That left me in the small blind with 1bb behind. I managed to quadruple up with a flush on the next hand but ran into quad queens just five hands later. 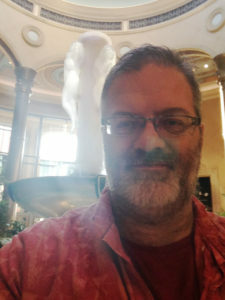 Monday morning I took a shuttle to the Orleans (free from the spot under the Linq) and waited around for a table to open up. For the unacquainted, the casino is full of very old people. I mean, even older than me. 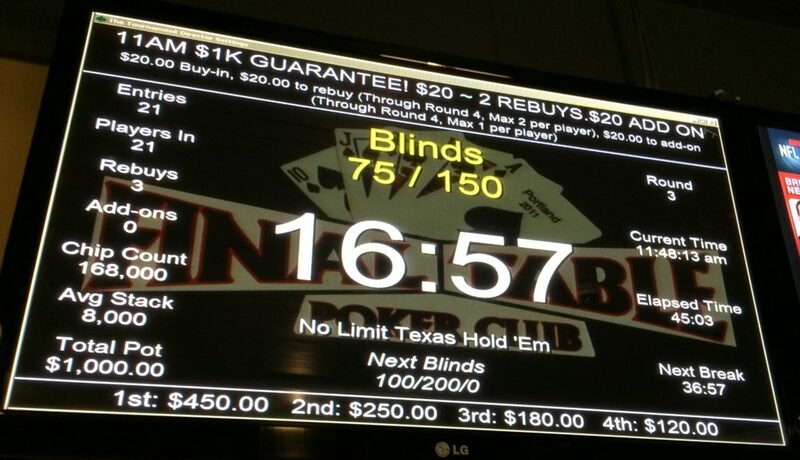 And it’s the place to go for Limit Omaha games. They had several tables of O8 at 4-8 and 8-16 (both with kills) running on a Monday morning. Admittedly, it was the Monday after a holiday, but there were 16 cash game tables running, more than anywhere except Bellagio at that time of day. Even as I write this at 2am on Tuesday, Aria has 19 tables, Bellagio has 16, and the Orleans has 12. 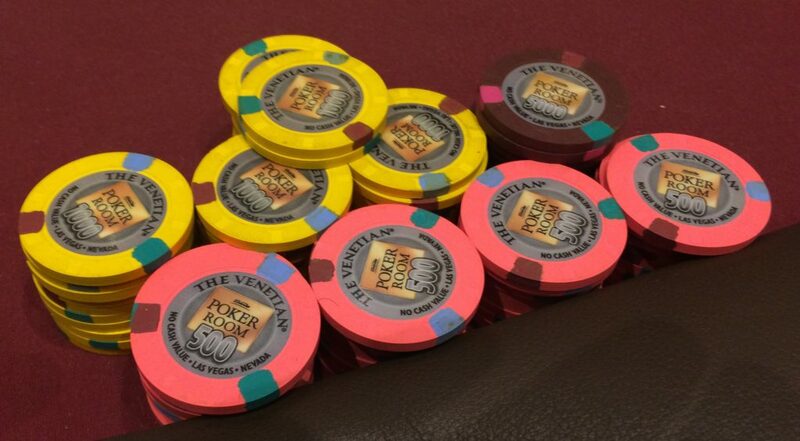 The Venetian has 9. The wait, though, was long enough that I considered getting off the list to just play the noon O8 tournament, but I late-regged that instead and made it partway through. There was one amusing hand in the first hour or so, where I was dealt A♣A♦A♥A♠, which is about as bad a hand as you can get in any version of Omaha, but I limped in just to see what would happen. I had another hand where I bluffed that I had a flush with the nut low draw on the turn (with 2s counterfeited by the flop) and not only made my low against an all-in player but bet another player off and took the high with a paired 4. Lost a big pot when my own low was counterfeited on the river and it was down from there. Played a smaller WSOP.com tournament and made the money, though it was only about enough to cover lunches for the days I’m here. 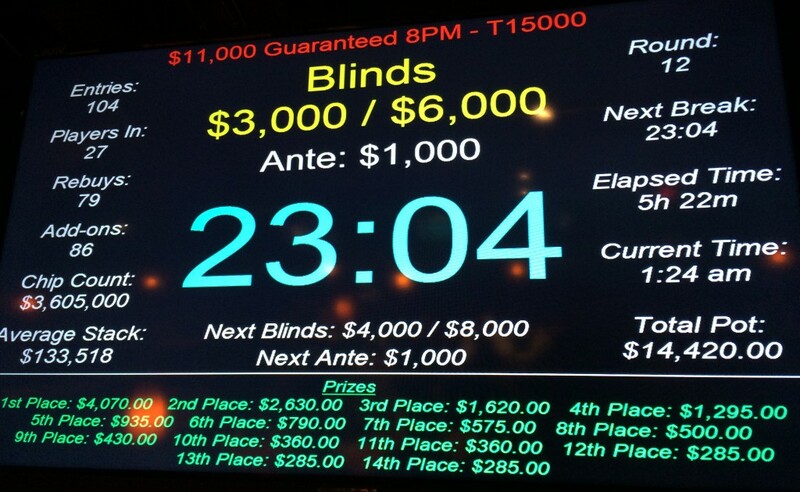 Tuesday was the $300 bounty tournament at the Venetian. It got 139 entries but I only made it through the first three levels, losing small amounts on a couple hands (including laying down K♣K♥ on an ace-high board with two diamonds to a bet of half my remaining chips to a guy who showed the 6♦2♦ he’d called my pre-flop raise with). I raised K♥J♥ in a hand and was called by Hani Awad, whose WSOP bracelet win I covered this summer. Awad ended up calling my bluff on a queen-high board with 7x9x and middle pair (the seven), but he’d already knocked out several players and had probably close to five times my stack. He took me out a couple hands later when I shoved AxQx pre-flop, he called with 9xTx from the big blind, and he made two pair by the turn. Not my finest hour. 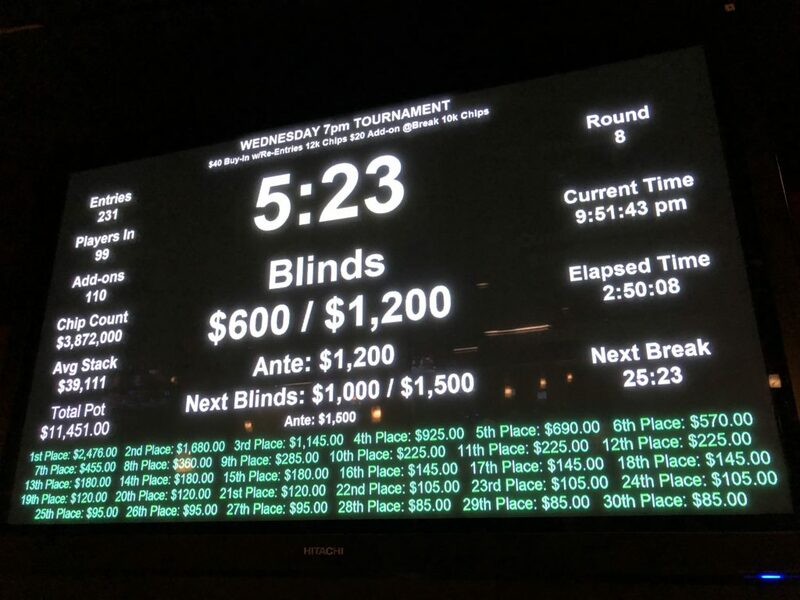 The final numbers for the tournament were $20,850 in the main prize pool, with an extra $13,900 in bounties, and $5,842 scheduled to go to first place. I talked briefly to Awad after he busted me, and he showed me he was wearing his bracelet, so some people at least don’t just toss them in a box or hock them on eBay. I’d been planning to play the 7pm tournament (a $200 bounty) but decided to force myself to play some cash game. 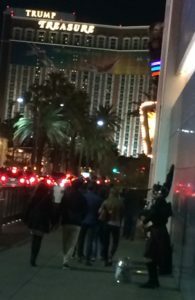 I herded back to the Orleans, sitting in the back seat of the shuttle with some tweaker gal who had “something something HELL” as her tramp stamp complaining about how long her free ride to was taking, had some surf and turf for brunchinner (a single meal for the day), then got on some lists. 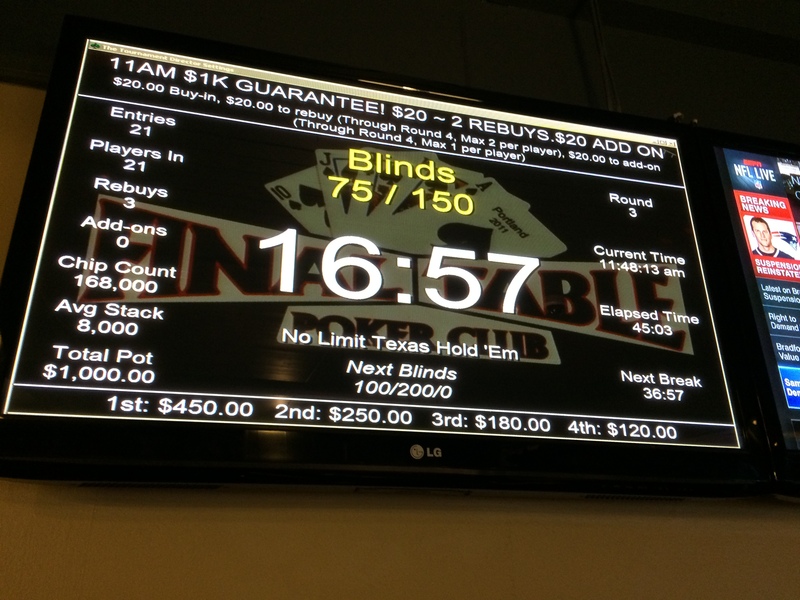 A $1/$3 NLHE game opened up relatively fast, and I sat down in seat 5. I was under the gun and raised the first hand I was dealt—T♥8♥—then was reraised by seat 7 to $30. Two players called, and I put in the extra $20. The flop was 7♣6♥5♣, I’ve got an open-ended straight draw for the ten, a backdoor flush draw, so I check it, then seat 7 shoves for more than my remaining stack of $170. The other callers fold, and it’s up to me. I called, the dealer put out a 6♠ on the turn and 8♠ on the river. I can only assume the guy shoved with AxKx because my two pair ended up taking the pot. From there on it was a mostly upward trajectory for ninety minutes, then I checkout out to go call my wife for the evening before deciding whether to play the $75 PLO tournament at 7. I got into the game late, just as the last level before the break was starting. There were only two tables and I had to wait as an alternate for a couple of minutes while a player who busted just as I was registering kept up a steady stream of complaints about having to go on the alternate list. A spot opened up for him by the time I got to my seat. I lasted all of ten minutes. I picked up a hand with a pair of aces, raised, was reraised from the other end of the table, made a 4-bet (we weren’t particularly deep at this point, less than 40bb) and he went all in with pocket kings which made a set on the turn. Back to the cash games, after having evened up the day before the tournament. 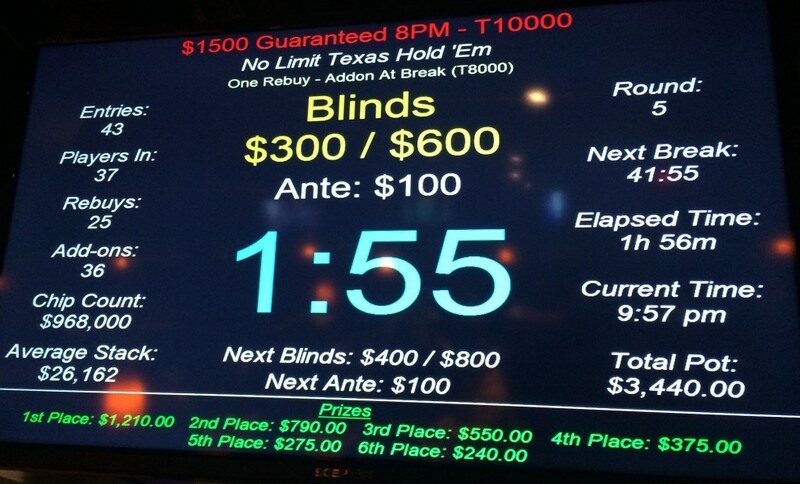 It took about 40 minutes in the $4/$8 O8 game for me to make up the tournament buyin and a little more. Got on the shuttle bus, had an interesting conversation with a cigar distributor from LA who mentioned he comes up to Portland several times a year, and decided to see what the cash games at the poker room in the Flamingo were like. The only time I’d played at the Flamingo before was in a late-night turbo tournament. The first thing I noticed after I sat down was that the place was a hotbox. I just about pulled up stakes and left after the first orbit, and had just determined I couldn’t stand it any longer when they finally turned the A/C on. Other than that, things went well and I booked a third winning cash session for the day, picking up another $50 in an hour before I told myself that I had to get to my room to get some sleep before a very early morning shuttle to the airport. No sleep before I wrote this for you folks, of course. Portland Meadows ran the first Survivor-style tournament in Portland (that I’m aware of) on New Year’s Eve. 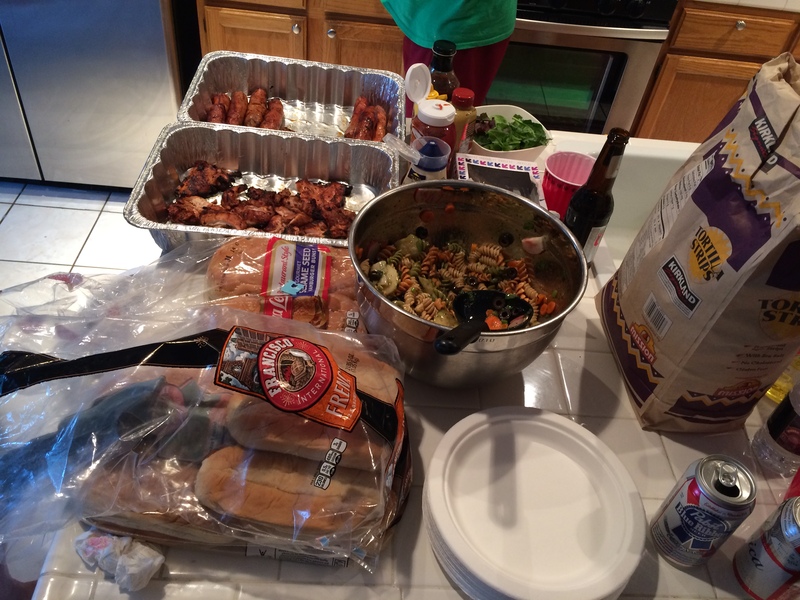 I wasn’t able to make it myself because of other pre-Vegas commitments, but it seems to have been well-received. It’s a bit difficult to make comparisons between this and similar tournament that don’t have add-ons, but thirteen players made as much as 1200% ROI on their buy-in (less if they did the addon or re-entry) in just over six hours, with a friend who made it through texting me the chop came at 6:09pm. Everyone got plenty of time to go out to celebrate the end of the year with their newfound cash. 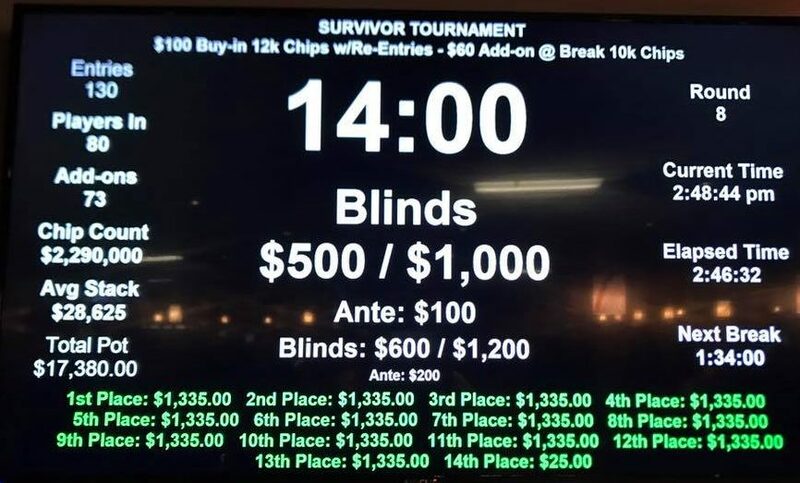 If it had been a straight 10% payout for 10% of the players (with no add-on) that would have been $1,000 for a $100 buyin (assuming 130 players and a $13,000 prize pool). If the prize had been set at $1,000, there would have been 17 players paid $1,000 (13% of the field) with an 18th player getting $380. 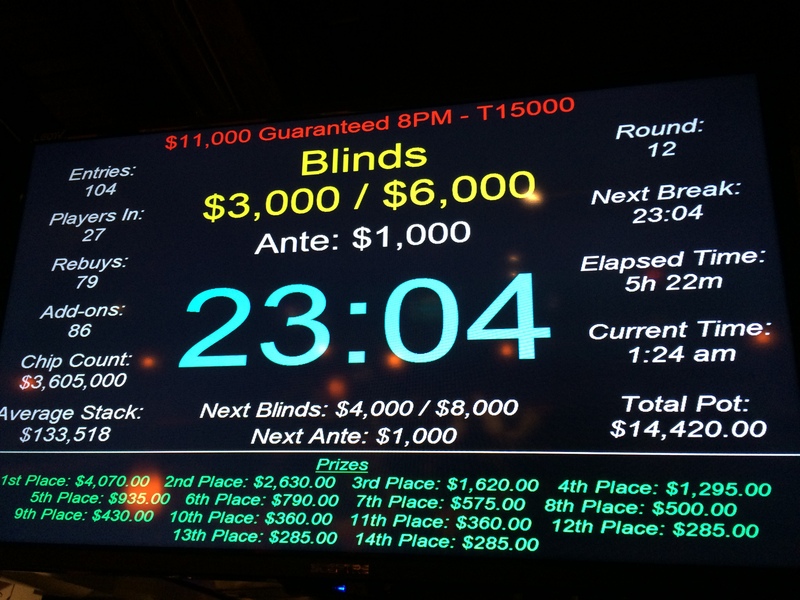 With standard payout structures, 10% of the prize pool is usually between 3rd and 4th place money in a field of 130. Nothing new to report. No unexpected closures (a couple of early closings for New Year’s Eve). The Game should be re-opening tomorrow. Rialto’s been open, Aces Full ran a game on Monday for the holiday, and hopefully (I haven’t seen an announcement yet) Final Table will be running a $20K this weekend. Monday. tournament director Matt Savage asked the question that many in the poker Twitterverse had been wondering about for over a week: “Where is @limonpoker”? The best-known personality on Live at the Bike has been a constant presence on Twitter for years, but mentioned during a pre-Christmas #PokerSesh that some Trump supporters had ganged up to get the account suspended because of his rather outspoken anti-Trump posts (of which there were many). 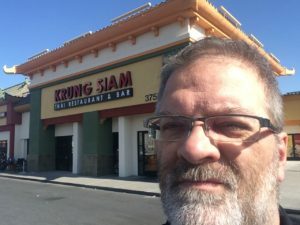 In Monday’s #PokerSesh (for the uninitiated, his weekly freeform call-in show), Limon mentioned that he’s not going to bother returning to Twitter (sad!) or any other social media, and offered up his back catalog to anyone who want to select segments and post them on YouTube and promote them to try to make money. Crowdsourcing his promotional efforts, in other words. Not insignificantly, for someone to get access to the videos in order to watch them and pull out segments, they’d have to at least temporarily subscribe to Live at the Bike at $20/month…not really PNW news, but Limon’s an Oregon kid…. The WPT is coming back to Bay 101 for the popular Shooting Star bounty championship in early March, and it’s preceded by a week of daily mega satellites. $275 Satellites have been running since December, but the big ones start 18 February, with daily $550 satellites running 25 February through 1 March and $1,050 sattys for three days starting 2 March. 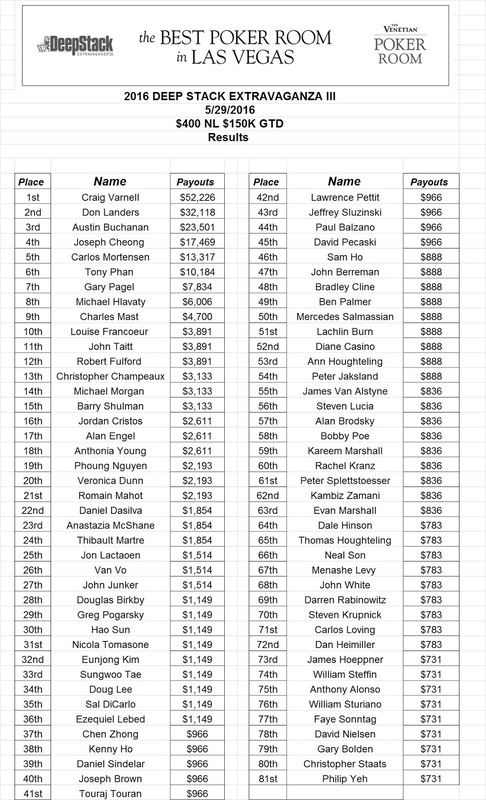 Bay 101 publishes the payout structures for their satellites, and you can see from the payouts on the $275 events that unless they get 48 players, no seat is awarded (with the money getting paid out on a standard curve), and with 48–79 entries, only one $7,500 seat is awarded, so the odds aren’t exactly good enough to travel to the Bay Area if what you want is a seat. 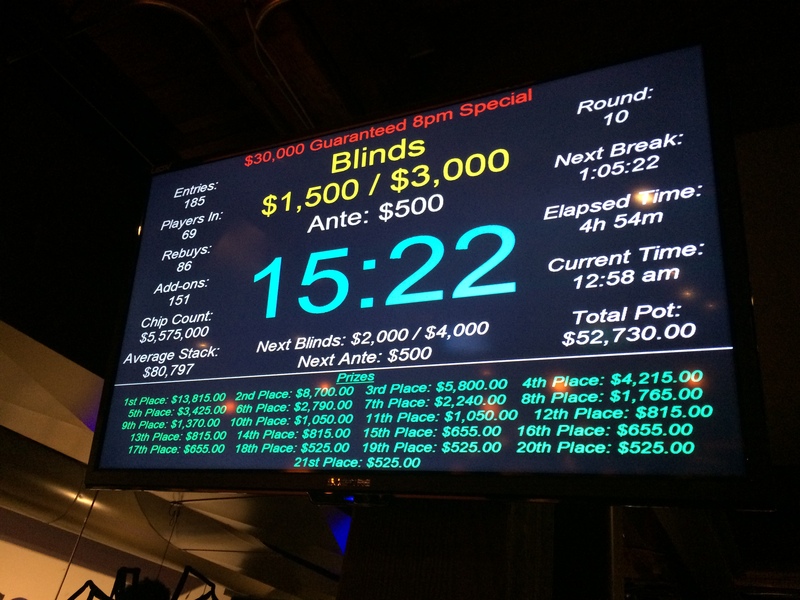 But the $550 and $1,050 buyins are a good buy if you want to get into the Main Event (which begins on 6 March). The big game this weekend should be the First Friday $20K at Final Table. The poker world is ramping back up after the holidays! The Venetian New Year’s Extravaganza runs through Sunday. 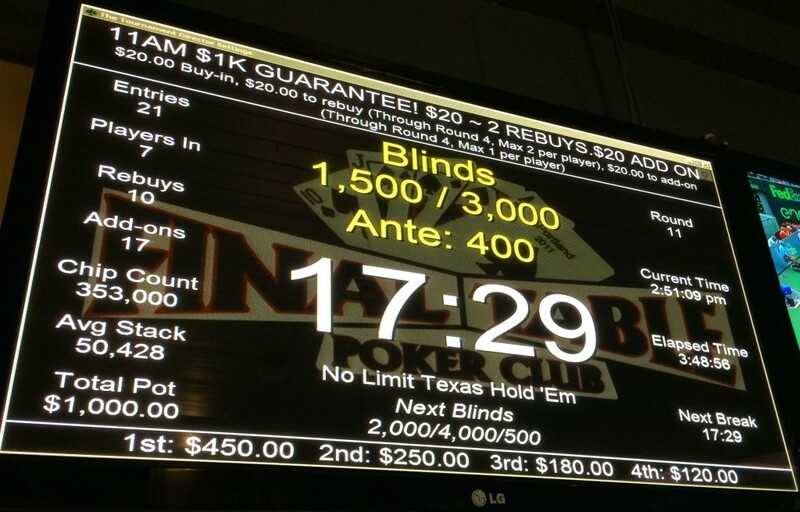 The last big event starts today with the first of four $250 entry flights to a $150 Guarantee. 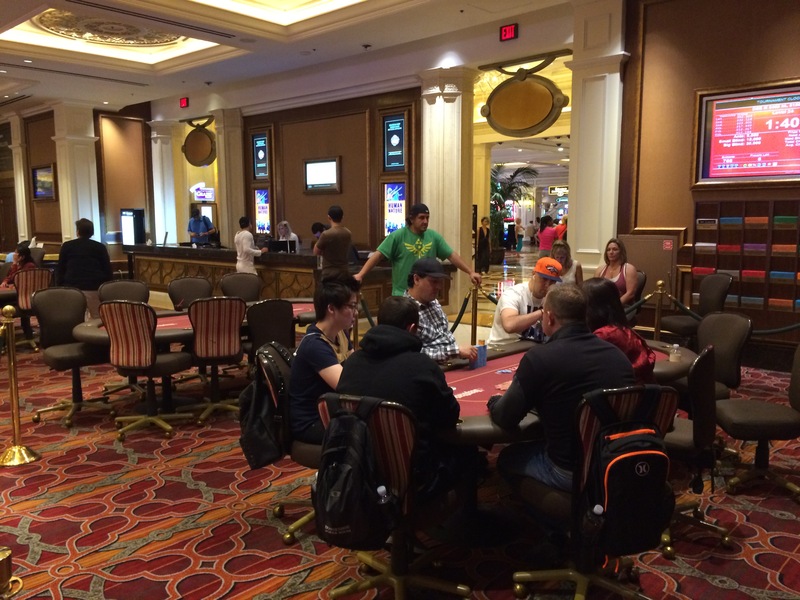 Evening games are a mixture of bounty, rebuy, and turbo tournaments. You can get updates on current tournaments at their blog. I missed it somehow, but the WPT California Swing Kickoff has a 2-day $100K Guarantee with a $250 buyin that starts today. Two flights tomorrow, with Day 2 on Friday. Saturday is a one-day $400 entry $100K guarantee, and Sunday there’s a WPT Rolling Thunder satellite with $400 entry that has 20 $3,500 Rolling Thunder Main Event seats guaranteed. 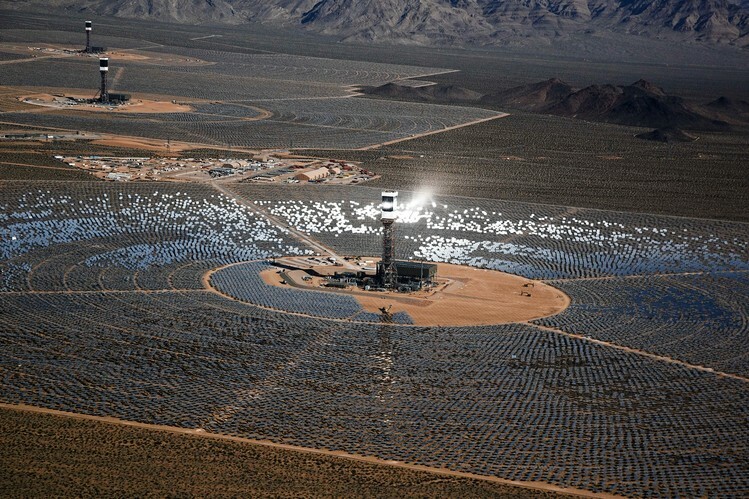 I’d probably have gone there this weekend instead of Vegas if I hadn’t missed it on the schedule. Another one that snuck past me is the Hustler Casino Poker Players Tournament (could they get any more generic? 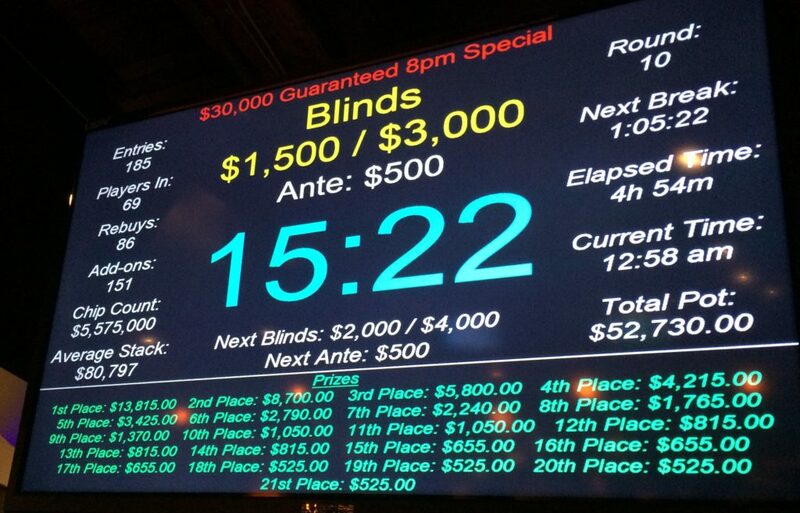 ), which starts a $400 buyin $500,000 Guarantee today, with two flights each day through Sunday and Day 2 on Monday. I don’t know how that got by me. Progressively fewer people make it to Day 2 on each starting day (10% today, 9% Thursday, and 8% after that). 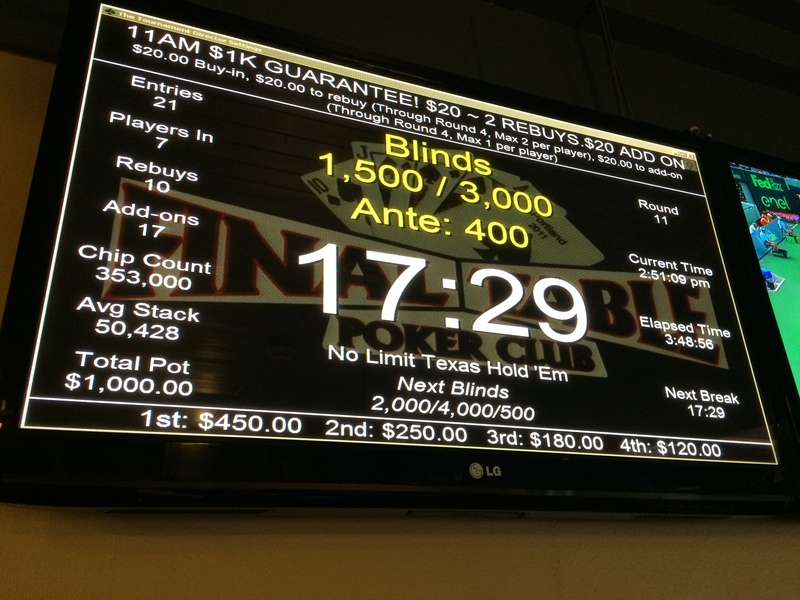 Next week is a $250K Guarantee for a $250 entry, with 15% in the money. Eugene’s Full House Poker has a Heads Up-Championship coming up, on 7 & 8 January. It’s a bracket-style elimination competition where you can buy 1 or more spots on the bottom bracket, at reduced rates. Seating is limited, so contact them for details and availability. The Heartland Poker Tour East Chicago series starts 12 January with a $300 buyin $100K Guaranteed tournament. There are three entry days, with Day 2 on 15 January. The first of three Main Event flights in on 19 January. It’s still possible to get flight/room packages at the hosting casino for either tournament for less than $600 total. Last year’s opening $100K had a prize pool of $298K, and the $1,650 Main Event prize pool was over $900K, with a top prize of $211K. Commerce Casino‘s LA Poker Classic begins a seven-week run on 13 January. There are a total of 60 events, with eleven of them having guarantees of $100K or more, plus the $10K buyin WPT Championship that caps the series. Structures have been posted for about half of the events so far. Of particular note for Portland players is the $570 entry Big O tournament on Groundhog Day (2 February). The 2-week Tulalip Poker Pow Wow starts 14 January with a $10K Guarantee, then a week including O8, HORSE, and PLO, before the $50K Guarantee and $100K Guarantee events on succeeding weeks. The $40K Guarantee Stones Gambling Hall Chip Amplifier is 15 January outside of Sacramento. Buyin in level 1 is $120 for 10K in chips, but the price and the number of chips go up for each level, with the last one being level 6 where $550 gets you 60K in chips. It’s back to Thunder Valley on the 17th, with Poker Night in America.As they’ve done before, they’re running satellites to the $5,000 buyin televised cash game (filmed 28/29 January), as well as a slate of 12 tournaments that features two $250K Guarantees (the first for a $450 buyin and the second for $1,100). In-between, there’s 6-Max, HORSE, and lots of satellites to the second of the $250Ks. Lest anyone think that this blog is going to turn into another guy complaining about his bad beats at the tournament table and life, let me just stipulate that I do have some winning sessions, and that as much as many of my old colleagues from my professional (not poker) career express bewilderment at how I ended up in my current circumstances, there are a lot of people worse off than myself, a middle-aged guy who’s had to go a thousand miles away from wife and home to take a job that’s populated mostly by people who could be my children (and who have more experience as live reporters and better poker resumes than me, in most cases, though perhaps not the same world-weary perspective on, well, everything). Live reporting hours are long. If an event starts at 3pm on a Day 1, there’s no dinner break, you work 10 hour-long levels with an hours of 15-minute breaks every 2 levels, so it wraps up about 2am. But as a reporter, you need to write an intro for the day as well as finish up any hands and write a recap at the end of the day, and someone needs to write the intro for the next afternoon, so you get there an hour early don’t usually leave the building until 2:30 or 3am. A 2pm restart for Day 2 or Day 3 means you get to the Rio by 1pm or 1:30 at the latest, and with the dinner break, play goes through to 2am again, and again with the recap. So figure 13 to 14 hours at least two days in a row. a little less on the third day if someone wins on schedule, but I’ve had one event where the last two players at the end of Day 3 agreed to play an extra level to finish things off, and then with the Mixed Omaha we had three full days plus the extra hour in Day 4. I’m on salary, but I figure with the number of days I’m working, if I was getting paid overtime, I’m still well ahead of what I have been doing to pay the bills, but it’s not what I was making ten years ago as a programmer or twenty-five years ago in the printing industry. If the only people who want to hire me any more are poker people, I’ll take it. I’ve made a lot of friends in the world of poker and I’ve got enough of an ego left (did I ever mention that I was once in the Oregonian’s list of the 200 “Most Interesting People in Portland”?) that I get a kick out of someone mentioning they read the blog. 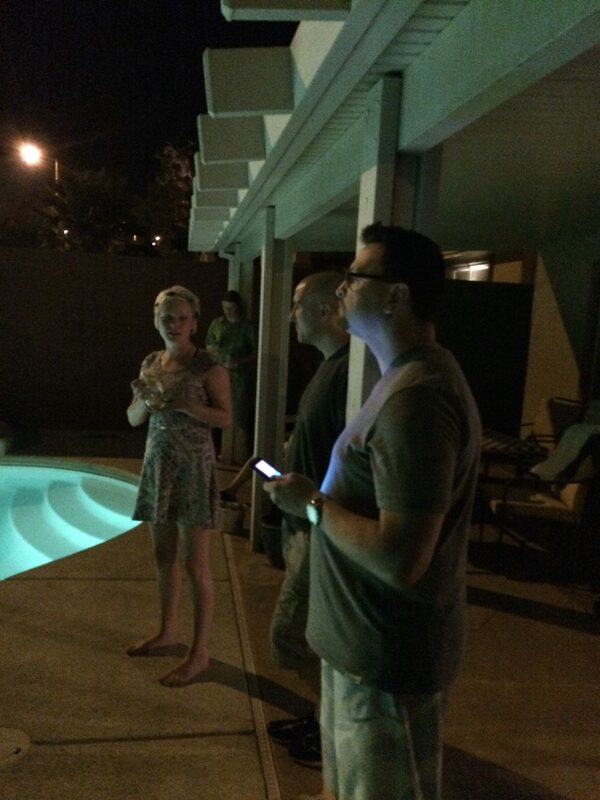 Got an invite to a party yesterday at the house where a bunch of the Oregon dealers are staying out in Summerlin (see photos above). Refreshed from Jello-O shots and America beer, I returned to the house and fired up a 0.25/0.50 PLO8 table. Played 35 minutes and made almost 200 big blinds. Then jumped into 3/6 Stud 8, jumped out after 20 minutes up 6 big bets. Made 18 big blinds profit in a 5-Max NLHE game, then went to bed. Two more weeks here in Vegas. Tomorrow I jump into the middle of the $1,500 Stud 8 tournament.